9:00 A.M. to NOON and 1:00 P.M. to 3:30 P.M.
Beginning February 1, 2008, customers will now have the option to apply for a Passport Card which may only be used for land and sea travel between the Unites States and Canada, Mexico, Bermuda and the Caribbean. Special requirements for Children under age 16 effective February 1, 2008. Passports for age 16 and over are valid for 10 years; for under age 16 they are valid for 5 years. Passport Fees to be paid by check or money order (NO CASH) payable to "U.S. DEPT. 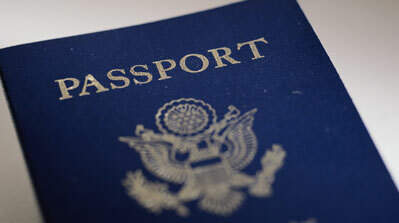 OF STATE"
In order to expedite service for your passport, you must pay an additional $60.00 fee per application. See Clerk for Rush Passport details.